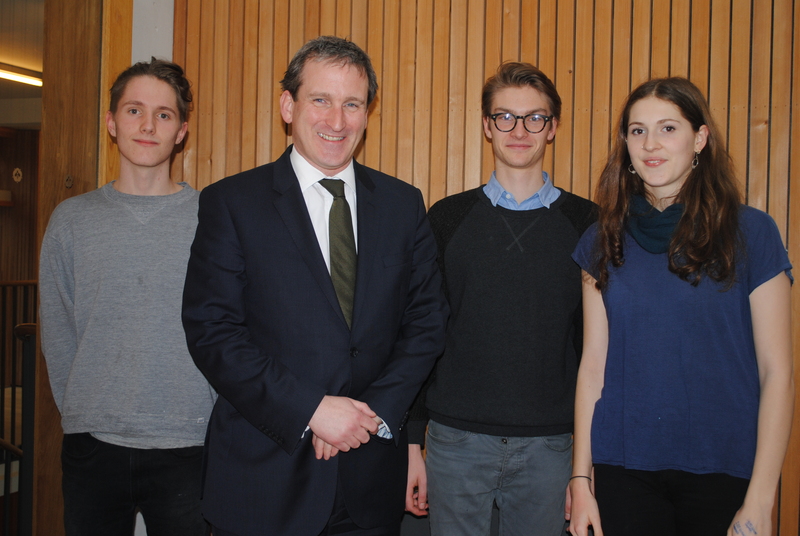 On 4 March, Bedales 6.1 students were invited to take part in a livestream Question Time event at Westminster. We combined our visit with a tour of the House of Commons, which we were originally due to undertake in the summer, the House of Lords and the Lobby Hall, where ordinary citizens can go and lobby MPs. We were fortunate to have the tour at a time when Parliament was in sitting, as usually school tours take place when Parliament is in recess. We saw David Davis, Hilary Benn, Diane Abbott, Dame Patricia Hodge and John Bercow, Speaker of the Commons, controlling the debate. The topic was initially on housing and communities, leading to urgent questions on weapon control. The House of Lords was rather more a slow-moving affair, with bowing to the empty throne one of the quaint conventions we witnessed. Students may have also been surprised to see on the order paper that the morning and afternoon sessions began with prayers. The MPs on the panel were Barry Gardiner, Labour MP for Brent North who was on the BBC Question Time panel last week; Carol Monaghan, Scottish National Party member for Glasgow North West; Nigel Huddleston, Conservative member for Mid-Worcestershire; and Chris Matheson, Labour MP for Chester. After a brief explanation of their positions on Brexit (they were all remainers), Bedales student Jonathan Greenfield asked the first question on referendums, which centred on the possibilities of tying referendums to specific constitutional points and making them more legally binding. The panel generally agreed this would be a good idea, with Carol Monaghan explaining that the Scottish Independence referendum of 2014 had been better prepared so issues were well understood by the time of the vote, and there was therefore less argument about the referendum afterwards. The second question came from another Bedales student, Mack Cowling, who asked a question about the ‘shelf-life’ of referendums – a very good question in which he even cited the correct date of the previous referendum. On Parliament’s control of the Executive, most argued that there is control, particularly with a minority government as at present, as well as Select Committees and Prime Minister’s Questions, where the incumbent does not know the questions beforehand. Barry Gardiner disagreed, however, seeing the control as limited even in current times. He pointed to the government’s use of ancient means (‘Henry VIII clauses’) to push things through. The trip was an unparalleled opportunity for the students not only to see Parliament in action but also to be able to debate face-to-face with current politicians. Watch the live debate here. The Politics department organised a trip to London on Monday this week, the main feature being a tour of The Houses of Parliament, our knowledgeable guide made this a particularly rewarding visit. We started in Westminster Hall which has survived since the 11th Century, where both The Queen Mother and Churchill lay in state, and Charles the First was tried. The tour continued through Lobby Halls to the green-seated House of Commons and the red-seated House of Lords, illustrated by some very entertaining stories and references to current politicians. We also visited the old St Stephen’s Chapel; the place of Parliament in the 17th century where Charles had overstepped his prerogative by bursting in and demanding the arrest of five Members in 1642. It is also where the Suffragettes chained themselves to statues after the current Palace of Westminster had been rebuilt in the Nineteenth Century (following a fire). After lunch we visited the Supreme Court opposite Parliament which had only come into being in 2009, superseding the House of Lords as the highest court of appeal. Although there was not a lot to see, our guide kept the students’ attention with some fascinating debate on ethical and legal issues in which everyone joined in. The exhibition, though small, also entertained us with stories including the legal landmarks which followed the discovery of a decomposing snail in a bottle of ginger beer! All the students really enjoyed the day, some commenting that it was the best school trip they had been on. They were a delight to be with. The Politics Conference in London recently attended by AS Politics students turned out to be a terrific day. Any one of the speakers would have been great to hear on their own but because the Central Methodist Church Conference Hall was a stone’s throw from The House of Commons, we were treated to a fabulous array of speakers, each of whom spoke for fifteen minutes and answered questions for fifteen minutes. Simon Hughes (Liberal Democrats) outlined the distinctive position of his party. Neil Hamilton, ex Conservative now Vice President of UKIP, spoke optimistically on UKIP‘s future based on their significant recent By Election results. John Bercow, Speaker of The House of Commons, gave a lucid account of his role, and Alan Duncan spoke about International Development. David Blunkett (with his dog), the Home Secretary under Tony Blair, was amusing and Tony Benn added gravitas with his heartfelt address on the topic of War. He was himself a pilot in The Second World War and spoke with considerable authority and phrased his delivery beautifully. Nadine Dorries (Conservative MP and I’m a Celebrity star) spoke about women in Parliament, and Douglas Carswell, a reform-minded Tory, outlined proposals for significant reform. We were also treated to an address from Tristram Hunt, rising star of the Labour Party and its educational spokesman. The only disappointment was the absence of George Galloway who last year set the hall alight with his fiery dialogue. This was the very best conference conceivable to grab the interest of politics students and thoroughly enjoyed by all.